I love to write about dividend income. December was a great month for me. Another alltime high! 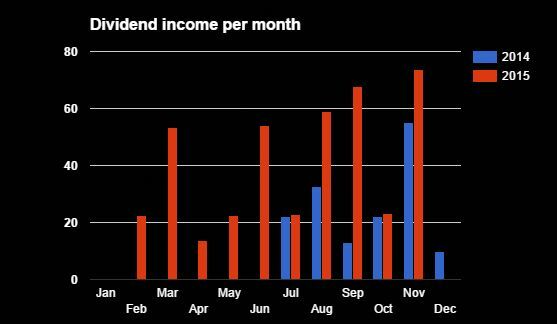 It's unbelievable, but reaching the first $100+ month of dividend income seems only months away! This is not a goal by itself, but after this point, the income seems to be substantial. This is a 15048% increase..
Of course there is a reason for this, as I did not invest that much in 2015. My (Dutch) broker used to pay the dividends at the ex-dividend date. This means I received the December dividends in November, last year. After they switched to another clearing partner for US stocks, this changed. Unfortunately I am now paid, at the same time everybody else gets paid. My goal was to receive $300 net dividends in 2015. This goal is totally crushed! Total net dividends received in 2015: $424.36. I am very happy about this. Let's set a more challenging goal for 2016. Unfortunately KMI cut their dividend by 75%, earlier this week. This was a reason for me to sell all my shares, yesterday. Let's see what happened during my time as a shareholder of KMI. This transaction is my first loss since I started this DGI strategy, almost 1,5 year ago. To me, it is important to learn something from this loss. However, I'm having troubles determining what I could have done differently, in order to prevent this loss. The easy answer: you shouldn't have bought KMI. With today's knowledge, that's absolutely right, but I didn't have today's knowledge back in July. Was it the company's high debt ratio that should have raised the alarm? Was it bad to buy stocks in KMI, when all oil related companies suffered major losses in stock prices? Are commodities in common bad for a long term growth portfolio? Anyone with thoughts on this? One thing remains very clear: a long dividend streak does not provide any guarrantees! November was an amazing month. For the 5th (!) 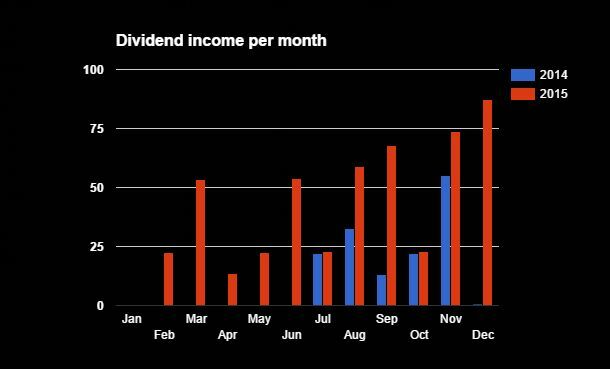 time this year, the dividend income has risen to an all time high. Loving the power of compounding over here! 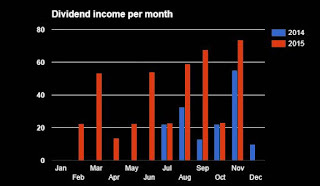 My 2015 goal for dividends is to receive a net total of $300 of them. This obviously means the goal is reached! I have to set a more ambitious goal for next year. I'm very excited with this progress to be honest. This is a 33.70% YoY increase. Where can I sign up for more of those please?! On November 10th, MCD increased their quarterly dividend from $0.85 to $0.89. This is a 4.71% increase. Due to this change, my YOC is now at 3.76%.